I'm having difficulty proving these. 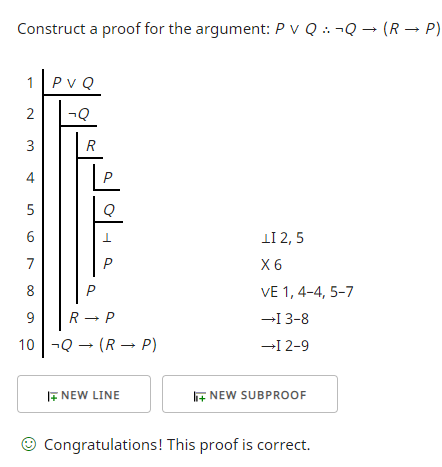 They seem obvious, but I can't figure how to set up formal proofs for them. Could anyone give me clues on how to start them? ¬Q→(R→P) from the premise P∨Q. Well, I know you stated your main issue is coming up with formal proofs (by which I'm going to assume you mean something like natural deduction) but let's just get started with the simplest conceptual level. this means that either P is false or Q is true based on the truth table that defines →. So we've shown they are equivalent via truth tables. Now, how do we move that into the realm of natural deduction? Since our conclusion has a negation, let's go with a subproof by contradiciton. I agree with virmaior's proof. Since I started these as well I figured I might as well leave them here since they contain a different presentation. Here are two proofs using Klement's proof checker. The rules you may have to use may be different. 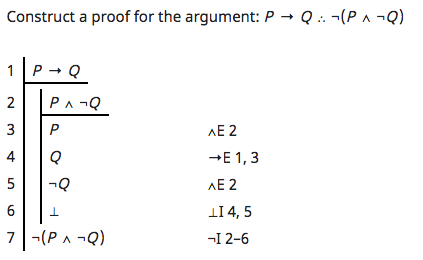 The proof uses conjunction elimination (∧E), conditional elimination (→E), contradiction introduction (⊥I) and negation introduction (¬I). To avoid the not ("¬") in front of "P∧¬Q" I started an assumption on line 2 assuming "P∧¬Q" hoping to derive a contradiction which I did on line 6. To get to that contradiction I split the conjunction into the two conjuncts, "P" and "¬Q" on lines 3 and 4. Then having "P" on line 3 and the conditional on line 1, I could put "Q" on line 5. Since lines 4 and 5 contradicted each other I could introduce a contradiction on line 6. This allowed me to discharge the assumption on line 2 and introduce the negative in from of "P∧¬Q". The proof uses contradiction introduction (⊥I), explosion (X), disjunction elimination (∨E) and conditional introduction (→I). Since the goal is a conditional "¬Q → (R→P)", I assume "¬Q" on line 2 and hope to derive "R→P". Since what I want to derive is a conditional as well, I assume the premise of that conditional which is "R" on line 3. At this point I need to derive "P". There is a "P" on line 1, but that is a disjunction. In order to get that "P", I have to deal with the "Q" as well. The first case is easy. 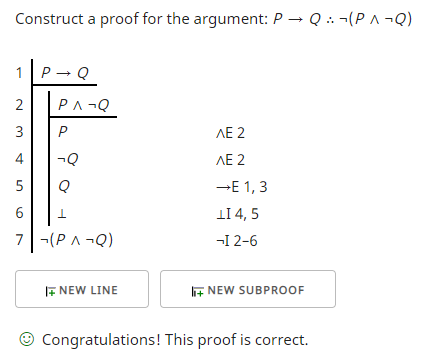 I have to start a subproof with just "P" as the assumption and the conclusion. This subproof is just one item, line 4. Having taken care of "P", I then have to take care of "Q". Fortunately line 2 and 5 contradict each other which allows me to introduce a contradiction on line 6. Having a contradiction I can use explosion to get anything whatsoever. I need "P", so I put "P" on line 7. This allows me to discharge both the "P" assumption on line 4 and the "Q" assumption on line 5 by eliminating the disjunction of line 1 on line 8. At this point note that I have a set up with "R" on line 3 and "P" on line 8. That means I can discharge the assumption of "R" on line 3 and put "R→P" on line 9. That allows me to discharge the assumption "¬Q" on line 2 and get the final result on line 10. You can use this proof checker online to help clarify the details yourself. The accompanying text forall x is available for further information. What you are required to use may be different. You will likely need to understand the above proofs well enough to present it in the format you need. To derive a negation of a proposition from a conditional statement, assume the proposition to hopefully derive a contradiction by eliminating the conditional, so that the negation may be introduced. Given the premise of P→Q , assume (P∧¬Q), derive a contradiction, then introduce a negation. Thereby deriving ¬(P∧¬Q) from P→Q. To derive a condtional proposition from a disjunction, use a proof by cases where the subproofs are conditional proofs. Given the premise P∨Q, seek to eliminate the disjunction. Assume each case (P, Q) in turn to derive (¬Q→(R→P) (hint: restatement and explosion). Thereby deriving (¬Q→(R→P) from P∨Q. Not the answer you're looking for? Browse other questions tagged proof symbolic-logic fitch or ask your own question.